Dubai, United Arab Emirates, 11 June 2018: Check out the new Palm Candy collection from Max Fashion for a fun and contemporary style that both parents and kids will adore! The Collection is simply delightful. 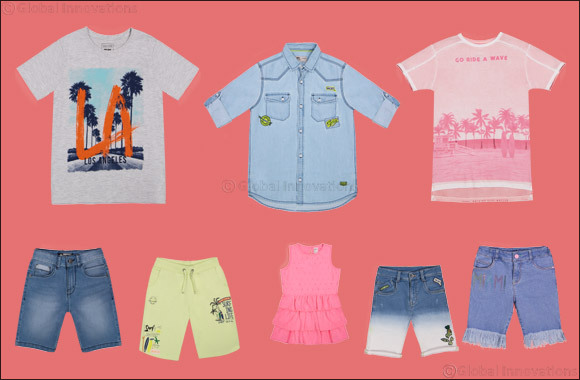 Tropical themed summer shirts, surf shorts, ruffle dresses and T-shirts featuring palm trees in vibrant colors are the highlights of this new line for kids. Palm Candy reflects the colors of the ocean, the blossoming flowers and the summer fruits, so think sweet long summer days on an exotic island. There’s nothing quite like a new wardrobe to get your little ones in the mood for holidays fun. This collection is a perfect start for the much awaited summer holidays, full of adventures and childhood magic. Palm Candy is bursting with styles and will take your kids to a universe of games, freedom and lots of ice cream. It features colorful girls and boys clothes ranging from active wear to party outfits. The clothes are ideal for days out, trips to the beach or playdates in the park and they are just too pretty to be ignored! To add a little fun to your seasonal wardrobe you can choose the colorful jumpsuit in an allover tropical print or the super cute ruffle pink dress for your little girl. The line for boys offers some fabulous day-to-day picks from graphic T-shirts to trendy denim with pineapple embroideries. One of the most adorable accessories in the collection is a playful watermelon slice handbag with tons of personality.